This distinct theropod dinosaur track, reportedly removed from the Paluxy in 1933 near the "Blue Hole" is mounted in the bandstand of the town square in Glen Rose, Texas. Surrounding it are large pieces of petrified wood, which is common in geologic formations overlying the Glen Rose limestone. As torrents of rain poured onto the rolling hills of Somervell County, Texas, walls of mud, water, and debris thundered through the once-peaceful Paluxy River Valley--engulfing trees, houses, people and animals, and sweeping them all downstream. Massive limestone slabs paving the river bottom were violently ripped from their prehistoric foundations, slammed together, and shattered. The locals called it "The Great Flood of 1908," one of the worst the town of Glen Rose, Texas had ever experienced. Although causing much loss of life and property, the tragic deluge also revealed unexpected scientific treasures--discoveries that would eventually make the small town famous. As aptly put by local historian Laurie Jasinski (2008), "it was a flood for the ages and a flood that revealed the ages." Fran, one of the most complete Acrocanthosaurus atokensis skeletons. It was found in Oklahoma and is now on display at the North Carolina Museum of Natural History. The first such discovery was actually made the following spring, as a local teenager named George Adams was wandering in a tributary of the Paluxy called the Wheeler Branch. There he came upon a series of large, three-toed footprints impressed in the limestone floor (Andrus, 1975; Jasinski, 2005). Similar tracks were evidently known in Texas from even earlier times by native Americans, who reportedly called them as "giant turkey tracks." However, local schoolmaster Robert E. McDonald soon identified them as dinosaur footprints, possibly based on early reports of similar dinosaur tracks from New England, where they were also initially mistaken for ancient bird tracks. Later geologists more precisely attributed the sharp-clawed, tridactyl (three-toed) tracks in Glen Rose sites to bipedal, meat-eating dinosaurs known as theropods (Shuler, 1917). Although no dinosaur bones had yet been found close by, Shuler followed the habit of ichnologists (track workers) in giving the track form itself a new name, in this case: Eubrontes (?) titanopelopatidus. Unfortunately, Shuler also followed the habit of some authors in giving small variations in specimens new names, and in 1935 named the track mounted in the band stand at Glen Rose Eubrontes (?) glenrosensis, even though it was probably made by the same species of dinosaur. This would mean that earlier name would take taxonomic priority, and invalidate the latter name. Complicating matters further, Shuler's "(?)" indicated that he was uncertain whether these tracks even belonged to the ichnogenus Eubrontes, and to this day there is some debate among paleontologists about the proper ichnological name for the Glen Rose theropod tracks. However, this may be somewhat moot, since there is considerable confidence about the identity of the trackmaker itself; which is believed to be the carnivorous dinosaur named Acrocanthosaurus tokenensis, whose bones have been found in early Cretaceous rocks of Texas and Oklahoma (Langston, 1974), and in one instance, only a few miles from the Glen Rose tracks. However, the Paluxy would also revealed other types of footprints, which took considerably longer for both locals, scientists, and the public at large to understand. Local Glen Rose resident Charlie Moss, cleaning a sauropod track. Photo circa 1934, courtesy of Beatrice Moss. Around 1910 another local youth named Charlie Moss and his brother Grady were fishing in the Paluxy River itself when they came across a trail of three-toed dinosaur tracks on a limestone shelf, along with a series of even more curious, oblong footprints (Andrus, 1975). Described by Charlie as "giant man tracks," these large, elongate footprints (typically 15-18 inches long) were as yet unknown to geologists, but evidently were soon accepted as genuine human footprints by many of the townspeople. For many years most locals seemed to regard these tracks as minor curiosities--evidently not realizing that the immense scientific implications of finding human and dinosaur footprints in the same rocks. Indeed, if confirmed, such a find would dramatically contradict the standard geologic timetable, which holds that dinosaurs (if we do not count birds) became extinct about 65 million years ago, whereas the first human remains are only a few million years old (a gap of over 60 million years). Moreover, the track beds in Glen Rose are now assigned by mainstream geologists to the lower part of the Cretaceous period, at or near the Aptian/Albian boundary, dated at about 113 million years (Young, 1974; Bergan and Pittman, 1990). A trail of indistinct elongate tracks along the McFall property, probably similar to ones Charlie Moss and other locals mistook for giant "moccasin prints." Close inspection shows that they show indications of a widely splayed, tridactyl digit pattern. They are now interpreted as partially infilled metatarsal dinosaur tracks. 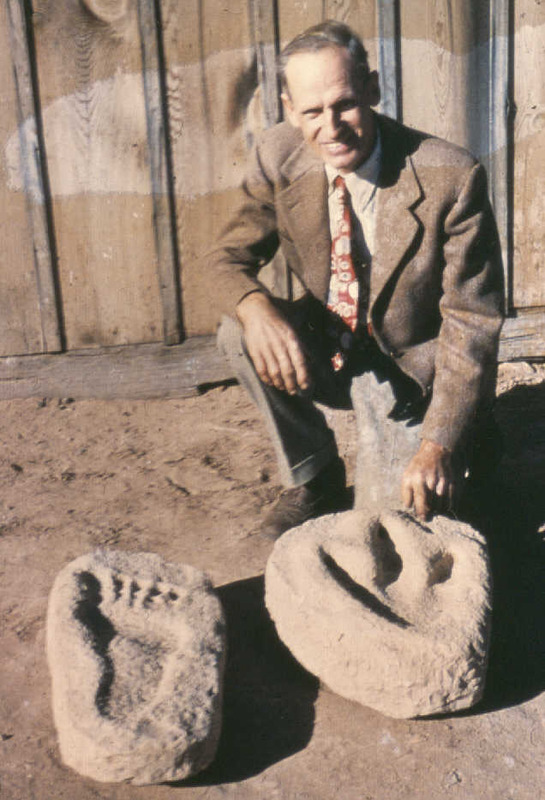 In the 1930's at least one Glen Rose resident, Jim Ryals, began chiseling out dinosaur tracks from the riverbed, and selling them to tourists and passersby (Bird, 1954). Ryals also reportedly cut out some "human" prints, but evidently no one took photographs of them, and their present locations are unknown. Around the same time another local resident, George Adams (discoverer of the Wheeler Branch tracks) is known to have carved and sold at least several "giant man tracks" and dinosaur tracks on loose slabs of rock. George's nephew Wayland once even related his uncle's carving technique to a group of creationist researchers, noting that his uncle would start with a suitable sized block already containing a depression, and then carve in human features at his leisure under the shade of a tree (Morris, 1980, p. 110-126). Evidently this technique involved less chance of breakage than chiseling and transporting real tracks from the riverbed, and allowed one to readily add print details that were typically indistinct or lacking on real prints. On the other hand, Adams was evidently handicapped by his limited carving skill; of the several loose "man tracks" which still exist and are generally attributed to him, all show serious anatomic errors, including misplaced ball and arch, and excessively long, misshapen toes. Both Adams and Ryals probably had economic rather than anti-evolutionary motives for their track activities (which occurred during the Great Depression, when jobs were scarce). Ryals may have believed he had cut out real human tracks, and Adams likely believed he was making improved versions of the assumed "real" human tracks in the riverbed. At any rate, such carvings were limited in number, and contrary to the suggestions of some authors, do not explain most of the alleged human tracks in the Paluxy riverbed itself. Indeed, carvings would play a relatively minor role in the overall controversy. However, they would help bring Glen Rose and its remarkable tracks to the attention of the outside world. Somehow a pair of carved "man tracks" from Glen Rose wound up at a trading post in Gallup, New Mexico. There, in 1938, they were spotted by paleontologist Roland T. Bird during one of his field expeditions for the American Museum of Natural History. At a nearby shop he also noticed two dinosaur tracks on similar rock slabs. Bird immediately recognized both pairs of tracks as carvings-- noting the anatomic problems they contained--but he wondered what would have prompted someone to carve them. Upon being told that they originated in Glen Rose, Bird decided to take a detour there on the way home to investigate further. Clifford Burdick with two of the loose track slabs that let paleontologist Roland T. Bird to Glen Rose. Both slabs are now widely acknowleged to be carvings made by Glen Rose resident George Adams during the late 1930's. The two loose "giant man track" slabs seen by Roland Bird in a Trading Post window, widely regarded as carvings. Note the very unnatural features, especially the multi-jointed toe marks. Two carved dinosaur tracks were also seen in the trading post window. With help from locals, Bird soon located a number of three-toed dinosaur tracks in the Paluxy riverbed. Then, with further inquiries and digging, he was astonished to find even larger tracks of a different type of dinosaur. These he soon recognized as sauropod footprints--made by huge, long-necked, four-footed dinosaurs known informally as "brontosaurs." Previously, sauropod tracks were unknown to science, although evidently they were first found by Charlie Moss around 1934, who reportedly believed, along with other local residents, that they were ancient "elephant tracks." When Bird officially identified and described these almost bath-tub sized tracks in several articles in National Geographic and Natural History, they made quite a splash among both scientists and the public alike (Bird 1939, 1941, 1944, 1954). It might be noted in passing that there is some controversy about whether Bird found the theropod and/or sauropod tracks on his own, or was shown some of the tracks by Charlie Moss or Ernest (Bull) Adams (George's brother--a local football hero, lawyer, and amateur archaeologist). In any case, Bird was clearly the first to scientifically describe the sauropod tracks in Glen Rose (which are the clearest in the world) and bring them to the attention of the scientific world and public at large. In 1939 and 1940 Bird and a local crew dammed a large portion of the riverbed and chiseled out a large section of the tracks in numbered blocks, as part of a WPA project. These were distributed to a number of colleges and museums, with the lagest portion going to the American Museum in New York. After languishing in storage for years, these blocks were later reassembled into a dramatic display under a large sauropod skeleton at the American Museum (Bird, 1985). Paleontologists often associated these sauropod tracks with the Pleurocoelus, based on sauropod bones from Texas and Oklahoma that appeared to belong to that genus; however, in 2007 they were reevaluated and argued to unique enough to warrant a new name: Paluxysaurus (Rose, 2007). The Texas state legislature subsequently declared Paluxysaurus to be the official state dinosaur. The famous Paluxy trackways excavated by Roland T. Bird in 1939 and 1940, often interpeted as an ancient chase scene, with the large sauropod dinosaur being attacked by a carnivorous theropod dinosaur. However, the paces are relatively short, suggesing that the carnosaur may simiply have been following the same path. Although Bird never reported any real human tracks in the Paluxy Riverbed, his writings would inadvertently lead to the spread of the "man track" claims. In one of his articles Bird mentioned the carved "man tracks" that led him to Glen Rose, as well as rumors from locals that "giant man tracks" could be found in the Paluxy riverbed itself. Bird related that when he asked Jim Ryals to show him such tracks in the riverbed, Ryals could only show him a single specimen, which Bird referred to as a "mystery track." Bird described this as, "something about 15 inches long, with a curious elongated heel." Noting that the print was too indistinct to diagnose precisely, Bird suggested that it was made by some "hitherto unknown dinosaur or reptile" (Bird 1939, p. 257). He would later prove to have been "on the right track." Creationists Embrace the "Man Tracks"
Soon Roland Bird�s writings came to the attention of some strict creationists, who sought scientific evidence for their belief that the earth and all life was created less than about 15,000 years ago, rather than having evolved over millions of years. Among the first creationist advocates of the "man track" claims was Clifford Burdick, who helped found the Deluge Society, one of the first creationist groups in America. After a brief visit to the Paluxy, Burdick published an article in the Seventh Day Adventist magazine, Signs of the Times, proclaiming that the Paluxy contained clear human and dinosaur footprints, and that this dramatically refuted evolution while supporting the belief in a recent Creation and the formation of the fossil record during Noah�s Flood (Burdick, 1950, 1955). By interweaving Bird's comments about carved tracks with those referring to dinosaur tracks in the riverbed, Burdick implied that Bird himself had reported and excavated genuine human tracks from the Paluxy, and that his photographs showed examples of such tracks. However, Burdick�s photos showed no natural looking human tracks in the riverbed--only the loose slabs Bird regarded as obvious carvings, some three-toed dinosaur tracks, and some ambiguous markings from outside Texas. In the early 1960's the Paluxy "man tracks" became more widely known when photographs of the same loose carvings were featured in the landmark creationist book The Genesis Flood by John Whitcomb and Henry M. Morris (1961, p. 173-175). 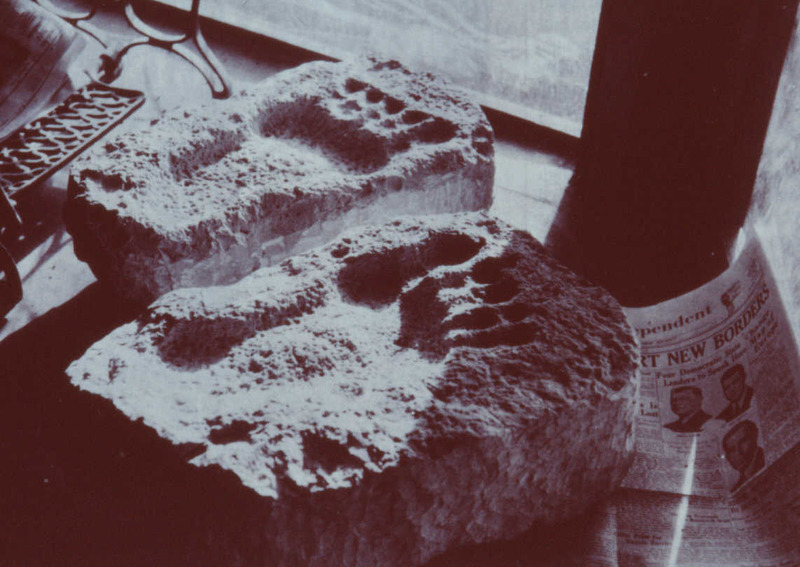 Like Burdick, Whitcomb and Morris suggested that these slabs were genuine "giant" human footprints known to have been excavated from the Paluxy riverbed--relying heavily on out-of-context statements by Roland Bird. A few years later, another creationist, A. E. Wilder-Smith, briefly visited the Paluxy at Burdick's invitation. In his subsequent 1965 book Mans Origin, Man's Destiny, Wilder-Smith followed the example of previous creationist authors in making strong "man track" claims based largely on inaccurate representations of Roland Bird�s work and writings. 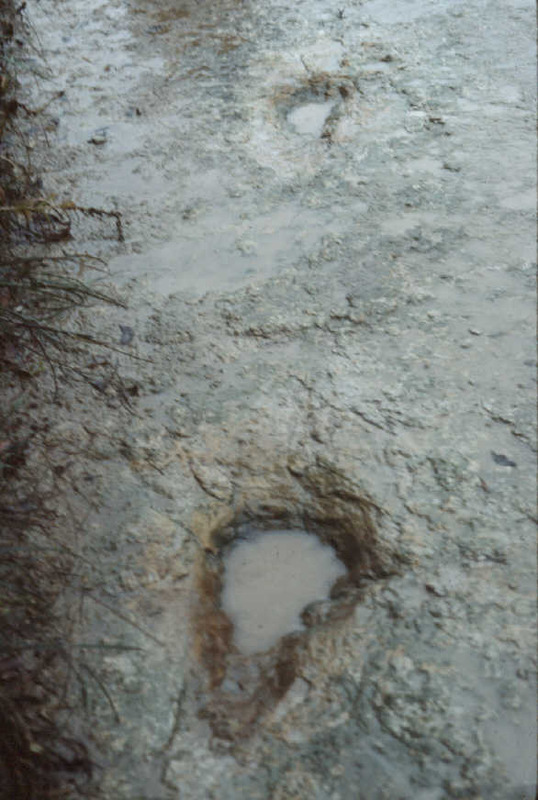 Douglas Block examining one of the supposed human tracks in the "Giant Run Trail" at the Taylor Site, during the filming of Footprints in Stone, 1969. The elongate print in the forground was selectively moistened to encourage a human shape; however, if one looks closely at the anterior of the track one can see indications of the splayed, infilled dinosaurian digits in a tridactyl pattern. Shortly after the publication of Wilder-Smith's book, the human track claims came to the attention of Stanley Taylor, a Baptist minister who owned a small apologetics film company called Films for Christ. 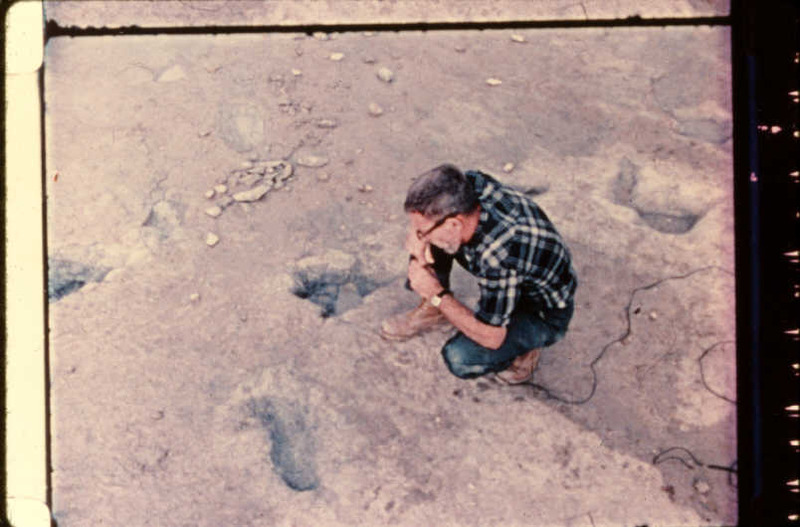 Taylor decided to locate and film "man tracks" in the Paluxy riverbed itself as part of a documentary on the Creation/Evolution controversy, and led a series of creationist expeditions to the Paluxy between 1968 and 1972 for this purpose. Taylor�s interviews with local residents led him to question the loose tracks promoted by other creationists, but aided him in locating a number of oblong markings on several sites which he and his coworkers (including representatives from other creationist groups) considered genuine human tracks. Taylor's initial findings were reported in a series of articles published by the Bible-Science Association--a large creationist group, hereafter referred to as BSA. These were followed by a 16 mm film produced and narrated by Taylor, called Footprints in Stone (Taylor, 1972). In the film, Taylor strongly encouraged the human track interpretations, even suggesting that several prints showed human-like toes. 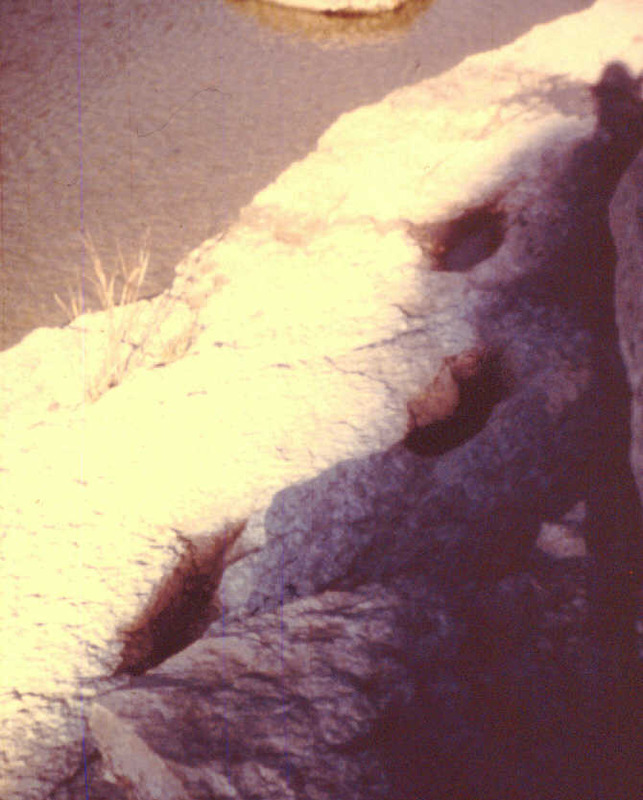 Some of the supposed "man tracks" occurred on a rock ledge in what is now Dinosaur Valley State park. However, the film focused most heavily on an area now known as the "Taylor Site," containing a deep dinosaur trail and several reputedly human trails, some of which Taylor's team reportedly excavated from under previously undisturbed rock strata. For many years the film was shown to schools, churches, and creationist groups throughout America, helping to widely spread the Paluxy "man track" claims. Cross section (by the Loma Linda team) through one of the loose "man tracks" seen by Roand Bird in Gallup, NM. Note that the subsurface fossil structures (especially at at the left side of the photo) are abruptly truncated at the depression, indicating a carved origin. Ironically, a creationist team from Loma Linda University who studied the tracks about the same time as Taylor came to very different conclusions. 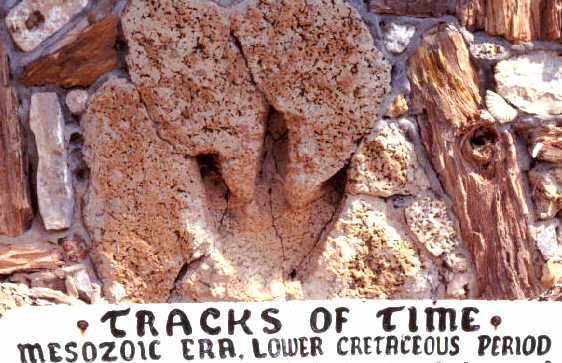 Based largely on field work in 1970, the Loma Linda team (consisting of Berney Neufeld, Leonard Brand, and Art Chadwick), pointed out that the alleged human footprints on the Taylor Site (which they called "Series 2") and nearby original McFall Site (their "Series 1") showed indications of tridactyl, dinosaurian digits. The workers were puzzled by the elongate shapes of the tracks at the Taylor and McFall sites, which they tentatively attributed to erosion acting on typical bipedal dinosaur tracks. They noted, however, that the tridactyl traces at the anteriors undoubtedly indicated a dinosaurian, not a human, trackmaker. They concluded that the "man tracks" at the State Park Shelf were not tracks of any kind, but merely erosional markings that had been selectively highlighted with water or oil to appear more humanlike. The team also examined and cross sectioned several "man tracks" on loose blocks, and concluded that they were probable carvings, based on anatomic errors, problematic subsurface features, and the knowledge that such tracks had been carved in Glen Rose. The Loma Linda team�s overall conclusion was that there the Paluxy did not provide valid evidence for the coexistence of humans and dinosaurs (Neufeld, 1975, p. 75). The "Original McFall Site" trail of elongate tracks, located a few hundred meters upstream of the Taylor Site. The prints on this ledge were promoted as human by Fred Bierle, but were acknowleged by other creationists to show dinosaurian features. Note the anterior spaying and tridactyl pattern on the lower two tracks. The tracks are now regarded as mud-collapsed metatarsal dinosaur tracks, and have eroded significantly since they were first documented in the 1970s. A few other creationists, such as Gerald Haddock (whose comments were included in Taylor�s movie), Ernest Booth (a biology teacher who examined the Paluxy sites), and Wilbert Rusch (then president of the Creation Research Society, hereafter referred to as CRS), were also skeptical of human track claims (Rusch 1971), but were overshadowed by the growing number of vocal "man track" advocates. Among these who visited the Paluxy and subsequently published booklets or articles promoting the "man tracks" were Fredrick Beierle (1974, 1977), Cecil Dougherty (1971), John D. Morris (1976, 1979), Kelly Segraves (1977), Wilbur Fields (1978, 1979), and Walter Lang, (1979). All were active proponents of strict creationism, especially Walter Lang, then director of the Bible-Science Association (BSA), and John Morris, of the Institute for Creation Research (ICR). During this period ICR, BSA, and other creationist groups regularly featured the Paluxy tracks as evidence against evolution in their books, articles, tracts, tapes, radio programs, and Creation/Evolution debates. These promotions culminated in the ostensibly definitive book on the topic by John Morris of ICR, entitled Tracking Those Incredible Dinosaurs (1980). Although none of the photographs in the book showed distinct, natural-looking human prints, Morris nevertheless endorsed the "man track" interpretation, following in the footsteps of his father, Henry, director of ICR and co-author of The Genesis Flood. For many years most mainstream scientists largely ignored the "man track" claims, sometimes implying that they did not want to dignify the claims with serious consideration. Ironically, this may have only fanned the flames of the controversy, allowing creationist to claim the humanlike prints had not been adequately addressed by "evolutionists." Those noncreationists who did comment publicly on the matter generally dismissed all the "man tracks" as carvings, or as erosion marks, or as middle toe impressions of large bipedal dinosaurs (Langston, 1979). Although some carvings and erosion marks have been involved in the controversy, none of these explanations would end up being the correct explanation for the most numerous and celebrated "man tracks," such as those on the Taylor Site. The "human" prints in Taylor's film and other creationist works were often lacking in detail, and fell short of the strong claims about them. Yet some of the pictured trails did appear to consist of striding sequences of roughly human-like footprints, any previously known dinosaur tracks. A mystery remained. State Park Shelf "Broadfoot" tracks. 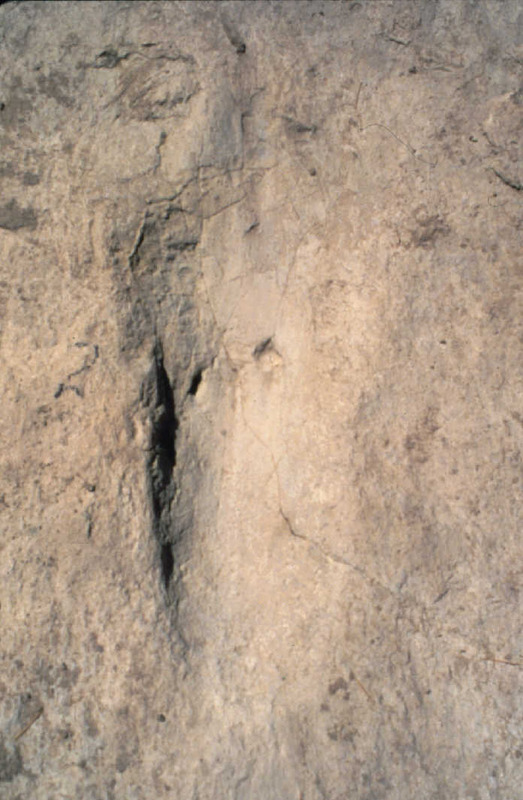 Interpreted by some early creationist workers as a pair of human footprints, these and other "man tracks" on the "State Park Shelf" site are erosional features. The depressions were often selectively moistened to encourage human-like shapes. My own interest in the Paluxy "man track" controversy was piqued in 1979 while reading some creationist literature during my senior year as a biology student at the College of Wooster in Ohio. The next summer I traveled to Glen Rose to locate and study the track sites firsthand, assisted by my friend Tim Bartholomew. Although we were at the time open to creationist ideas and actually hoping to confirm the human track claims, we resolved to examine and record whatever we found as thoroughly and carefully as possible. We brought along a basic set of excavation, documentation, and photography equipment, along with a good supply of curiosity and sense of adventure. Although the maps in the creationist literature were often imprecise, they were sufficient (with help from local residents) to guide us to the main "man track" localities and individual "man track" markings. We were fortunate to have arrived near the end of a long drought, allowing us to expose, clean, map, photograph and study the sites, most of which are usually under shallow water. Taylor Site, facing west, 1980. Taylor Trail proceeds from bottom left to center top of photo. Track IIS,-5 is at bottom, where the Taylor Trail intersects the IID "Deep Dino" trail. We soon concluded, as did the Loma Linda team (whose work we were not yet aware of), that some of the alleged human tracks, such as those on the "State Park Shelf" were merely erosional features and random irregularities of the rock surface. When we selectively applied water to the markings, we found that we could closely replicate the features in creationist photos. However, without such enhancement none of the markings showed clear or convincing human features, and many contained features incompatible with real human prints, especially in regard to bottom contours. Taylor Trail track IIS,-2, showing indications of three-doed dinosaurian digit pattern at anterior. Photo by Larry McKenze, taken during Kuban/Barthomew expedition, 1980. However, we were much more excited and intrigued at what we found at the Taylor Site, which we located with the assistance of Emmett McFall (since deceased) whose property bordered the site. 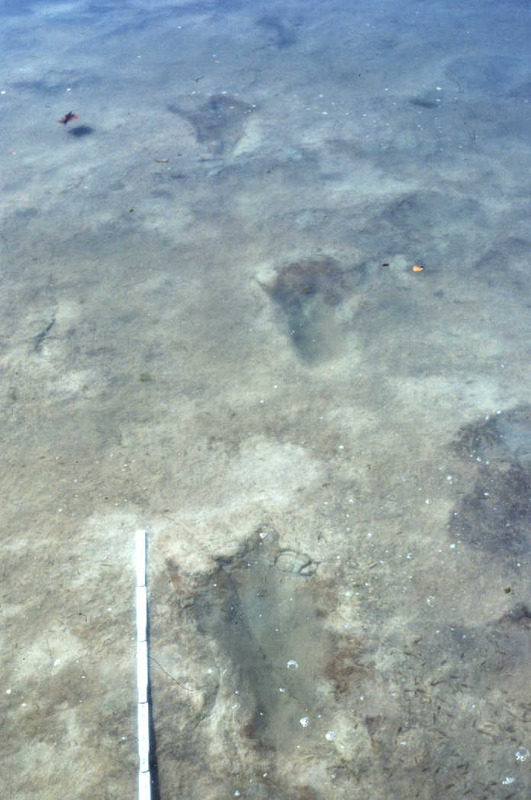 While removing the sediment and debris from the site, we soon saw that the alleged "man tracks" there were real elongate footprints, occurring in left-right striding trails. And some did have roughly humanlike shapes. But as we exposed and cleaned more of the site, we found that at least some prints in each trail splayed widely at the anterior end, and/or exhibited shallow traces of long, tridactyl, digit patterns--more compatible with dinosaur toes than human ones. Moreover, on some of the prints the longest anterior grove appeared on the outside of the foot--whereas the human "big toe" would be on the inside of the foot (and would not normally make such long impressions). 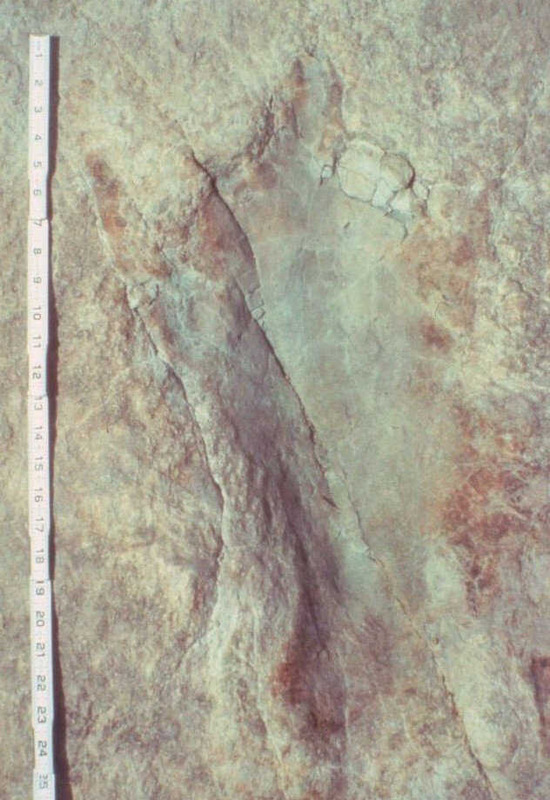 It became increasingly apparent that the alleged "man tracks" at the site were neither human footprints, nor merely eroded specimens of typical three-toed dinosaur tracks (as suggested by the Loma Linda team), but evidently some type of unusual dinosaur tracks with elongate "heels." 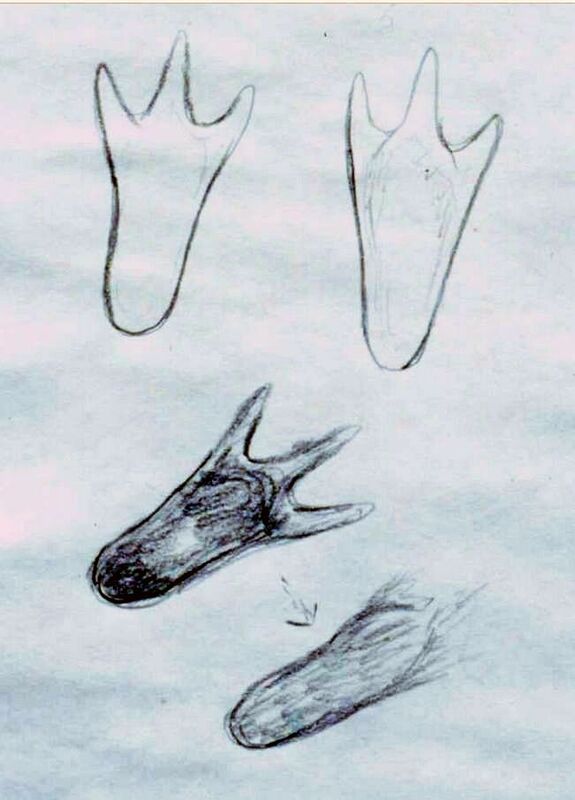 Sketch made by author in fall of 1980, proposing what a clearer example of a metarsal dinosaur track would look like, and how such tracks may look superficially human-like when the digits are indistinct. Soon after returning from the trip, I began poring over our Taylor Site photos, casts, and measurements, studying the interesting features of the Taylor Site tracks. I then sketched what I envisioned a distinct composite track would look like (combining the collective features of all the tracks), and compared it to drawings and photos of dinosaur leg and foot anatomies. Suddenly it occurred to me that the elongate shapes of the tracks probably did not relate to an unusually-shaped foot, but more likely to an unusual locomotor behavior or way of walking. That is, I realized the elongated heel-like posteriors on these prints were best interpreted as just that--impressions of the heels and soles of the dinosaur's foot (technically the metatarsal or metapodial segments), which are normally held above the ground by bipedal dinosaurs. In more technical terms, my thesis was that these dinosaurian trackmakers evidently had, for some reason, walked in a basically flat-footed or "plantigrade" fashion-- rather than impressing their toes only in a "digitigrade" fashion, as is more typical for bipedal dinosaurs. I initially attributed the shallowness of the digit marks to erosion and/or poor initial impression, although another important factor would later be found (along with confirmation of the metatarsal concept). But whatever the reason for their shallowness, the anterior impressions definitely indicated long, tridactyl digit patterns compatible with dinosaur feet and inconsistent with human ones. The "man track" advocates had apparently overlooked these anterior features, and instead focused on the oblong, roughly- humanlike metatarsal section at the rear. While delving into the scientific literature on dinosaur tracks, I could find no previous reports of metatarsal dinosaur tracks in striding trails, although some had been long known as resting or stooping tracks, attributed to small ornithopod (bipedal, plant-eating) dinosaurs from early Jurassic rocks in New England (Lull, 1953). Some of the paleontologists I initially consulted seemed skeptical that bipedal dinosaurs would walk this way, or leave such tracks. Yet as I took additional trips to study and map further tracksites (noted below), the evidence mounted that some dinosaurs did just that. In the course of my research into past Paluxy work, I was referred to Ernest Booth, a former biology teacher with creationist leanings, who was running a small educational media company called Outdoor Pictures. Booth had visited the Paluxy tracks around the same time as Taylor and the Loma Linda team, and like the latter, had concluded that many of the tracks were forms of elongate dinosaur tracks, while others were selectively highlighted erosional markings, and still others (on loose blocks) probable carvings. Although he had not yet published his findings, he related in phone conversations and correspondence with me that he was disturbed over the way other creationists were depicting the tracks as clearly human. He explained that he had repeatedly urged the "man track" proponents to reconsider their position in view of conflicting evidence, to little avail. Upon sharing my findings with him, Booth indicated that he agreed with my conclusions, and offered to collaborate in a publication on the subject. Just as I was beginning to consider the "man track" controversy largely resolved except for the publishing phase, the affair took on a new dimension when a former Baptist minister named Carl Baugh entered the scene in 1982. Baugh, who claimed several advanced degrees in science and theology, all of which are questionable, (Kuban, 1989b), began to excavate new sections of the McFall ledge, herein referred to as the Baugh/McFall sites. 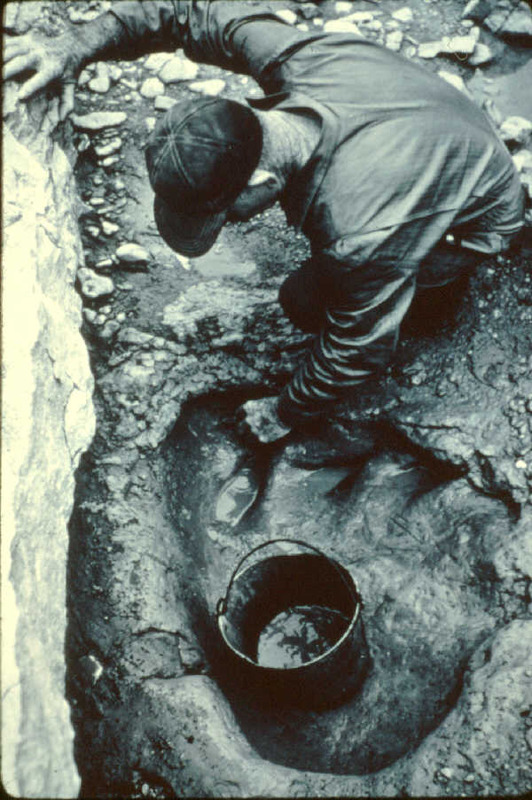 Carl Baugh's first excavation site, 1982. It contained a trail of dinosaur tracks with partial metatarsal impressions, which Baugh interpreted as human tracks overlapping dinosaur tracks, and an isolated depression (shown close up in the accampanying photo) that Baugh claimed as another human track. He erected a black metal plaque naming the trackmaker "Baughanthropus." 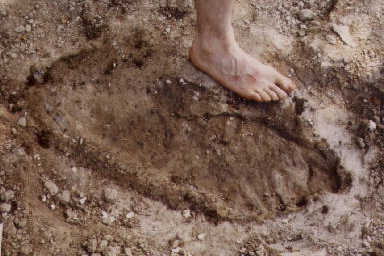 One of the tridactyl dinosaur tracks with partial metatarsal impression, promoted by Baugh as a dinosaur track overlapping a human track. One of Carl Baugh's first alleged "man tracks," --an indistinct elongate depression near a dinosaur trail but not in a striding sequence. It is visible below the black plaque in the photo at left. It might represent a touch of the dinosaur's tail or other body part, or a place where a plant fossil once occurred. Before long Baugh had announced the discovery of numerous clear human prints, some reputedly so distinct one could distinguish male from female (Baugh, 1982; Taylor, 1982). Some creationist organizations (such as ICR and CRS) appeared cautious of such claims, and either ignored or weakly supported them in their publications. However, other groups such as BSA actively promoted Baugh�s work and claims (Bartz, 1982a, 1982b) despite the serious problems they entailed (summarized below). Meanwhile, Baugh also promoted his own claims through local schools, churches, video tapes, newsletters, press releases, and creationist conferences. As time went on, Baugh claimed even more human tracks, as well as other alleged out-of-order fossils, including "giant cat prints," a "human tooth," a "hammer,", a fossil "finger," and a Cretaceous "trilobite" (Baugh, 1987), all later refuted by other workers. By 1984 Baugh had established a small "Creation Evidences Museum" near Dinosaur Valley State Park from which to further support his claims and activities. In my study of Baugh/McFall sites in 1982 and 1983 I found that none of the "man tracks" there closely resembled real human prints. Some were mud-collapsed and/or poorly preserved specimens of metatarsal dinosaur tracks. 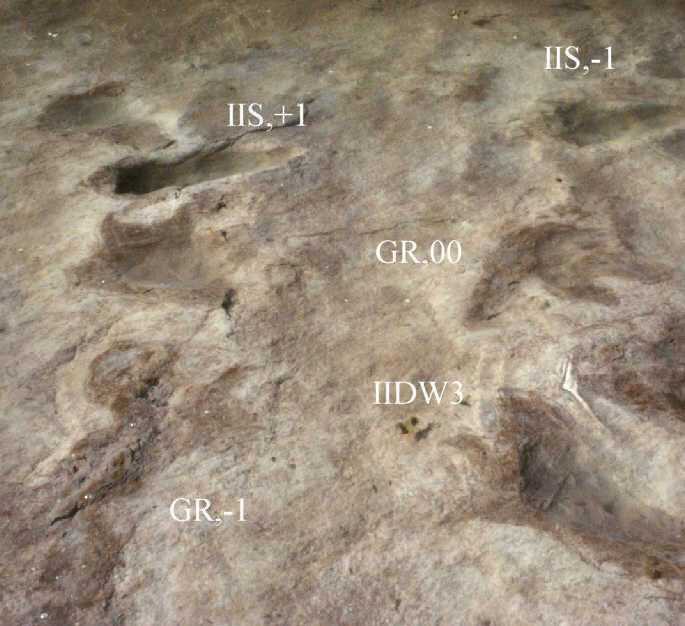 Several in striding sequence were dinosaur tracks with partial metatarsal impressions; these Baugh had identified as human tracks overlapping dinosaur tracks. Others were long (and sometimes curved), incompletely cleaned grooves which occurred near dinosaur trails. These may have represented intermittent impressions of the dinosaur's tail, snout, or other body parts. Other "man tracks" were vague, shallow, often isolated depressions (not in striding trails), with only a remote resemblance to human footprints. One set of "toe marks" were composed of an invertebrate burrow system (made by ancient worms or crustaceans). Other alleged "toes" were small notches or grooves at the margins of vague depressions, formed by selectively abrading or pushing into firm marl (limy clay) left at the margins of incompletely cleaned depressions, or gouging at friable portions of the limestone. Often this was done under the pretense of "uncovering" toes; such misconduct by Baugh was repeatedly witnessed by myself, Alfred West and others present at the site, and can be seen in one of Baugh�s own video tapes (Baugh, 1982). Baugh's so-called "Max" giant print. Besides its immense size and unnatural features (especially the lack of normal bottom contours), the author confirmed that the print margins were entirely composed of marl (the hard clay above the track surface) that had been gouged to suggest a human-like shape. Despite Baugh's creative efforts, none of the markings on his excavations closely resembled real human footprints. Many of the print outlines, alleged toe marks, and other features showed unnatural shapes, sizes, and positions. As time went on Baugh's boldness in manipluating field evidence seemed to increase; at one point he claimed to have excavated a giant human print (dubbed "Max") which was almost 26 inches long. As this author and others confirmed by first-hand examination, it had been merely gouged into the firm marl overyling the limestone track surface. It's bottom countours and other features conflicted severely with those of a real human print, even aside from its monstously large size. When critical observers visited the site, Baugh would often state that the prints were perfect when first found, but that the toes had "eroded away quickly." Indeed, they did often deteriorate quickly--much more quickly than real features in rock, because such toes were typically composed of marl or clay incompletely or selectively removed from the substrate. Real track features generally remain recognizable for years or even decades. Baugh's other alleged out-of-order fossils were found to be similarly lacking in scientific support, as reviewed in a later section. In 1982 I arranged another trip to Glen Rose with the goal of locating clearer specimens of metatarsal dinosaur tracks, as well as studying Carl Baugh�s recent excavations. During early attempts to locate and interview Baugh himself, I was referred to Alfred West, a local rancher who had assisted Baugh in his work. West guided me to the Baugh excavation sites, explaining what the various markings were claimed to be, and how he had grown increasingly disillusioned with Baugh�s claims and methods. As we discussed the evidence there, including some metatarsal tracks at the Baugh sites, I mentioned my findings on the Taylor Site, and my desire to document clearer specimens of such metatarsal tracks. To my surprise, West informed me that many such tracks existed right along his own property, which bordered the Paluxy. A portion of a trail of metatarsal tracks on the Alfred West Site. Track IIDW13 at bottom is one of the best preserved metatarsal tracks in the Paluxy, but the next track in sequence is more mud- collapsed and thus shows a less distinct, more human-like shape (and could become even more human like with erosion and/or infilling). The West site turned out to be a veritable showcase of elongate dinosaur tracks and their variations. 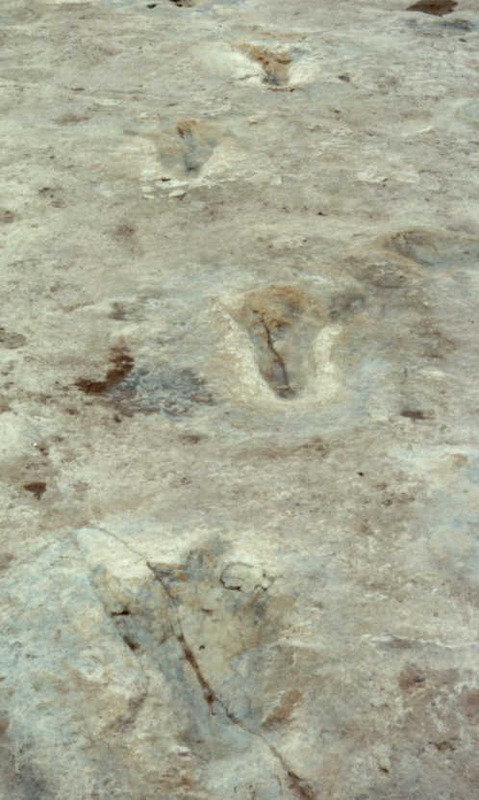 Besides containing many normal digitigrade dinosaur tracks, including some exceptionally long-strided "running" trails, the site contained several trails comprised primarily of metatarsal tracks of varying quality. Within individual trackways one could see typical digitigrade dinosaur tracks, distinct metatarsal tracks (with a well defined "heel" and three clear digit marks), as well as indistinct (mostly mud-collapsed) metatarsal tracks that appeared more humanlike. The site (which has since been named for Al West) clearly illustrated that a single dinosaur was capable of making multiple track types, including elongate prints similar to ones called "human" elsewhere. It also demonstrated that certain dinosaurs would sometimes alternate between a digitigrade and plantigrade (or quasi-plantigrade) walking gait (Kuban, 1986a, 1986d, 1986e). I immediately began to clean, map and study the site, with the assistance of West and his wife Martha, who expressed surprise that no one had paid much attention to the site before, despite its obvious relevance to the track controversy. Baugh showed no interest when West it to him. John Morris briefly mentioned the site (which he called "Shakey Springs") in his 1980 book (pp. 94 and 235), stating that it contained unidentified elongated dinosaur tracks that "under some circumstances might be mistaken for human." However, Morris did not explain under what circumstances they could be mistaken, or relate them to the similarly shaped tracks he called "human" on other sites. Indeed, had the West Site tracks been fully described, they would have severely undermined the human track identifications elsewhere. West commented that similar elongate dinosaur tracks could be found "all up and down the river." He was right. 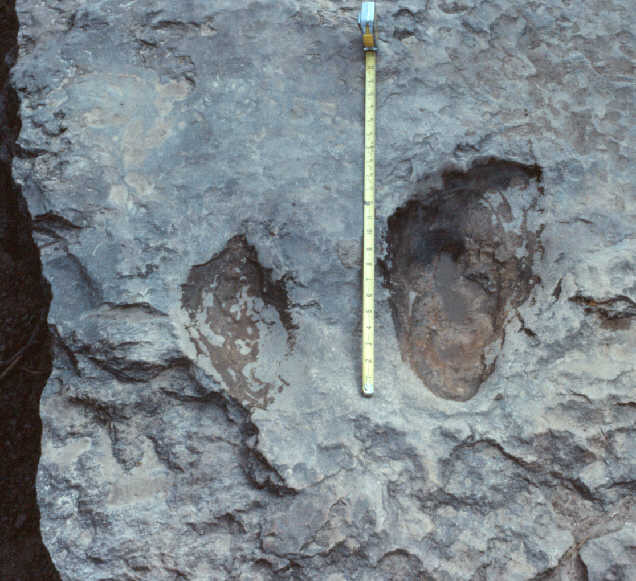 Besides being prevalent at the West, Baugh/McFall, and Taylor Sites, metatarsal dinosaur tracks have since been documented in several other areas of the riverbed. Such metatarsal dinosaur tracks not only appeared to explain the "best" of the creationist �man tracks," but in my view are also the most likely source of the original "giant man track" sightings by local residents decades earlier. After all, metatarsal dinosaur tracks with indistinct digits marks often look more like large human tracks than anything else the townspeople would have been familiar with at the time. Despite their being misinterpreted for decades, they are also remarkably common in the Paluxy (actually outnumbering non-metatarsal tracks on some sites). 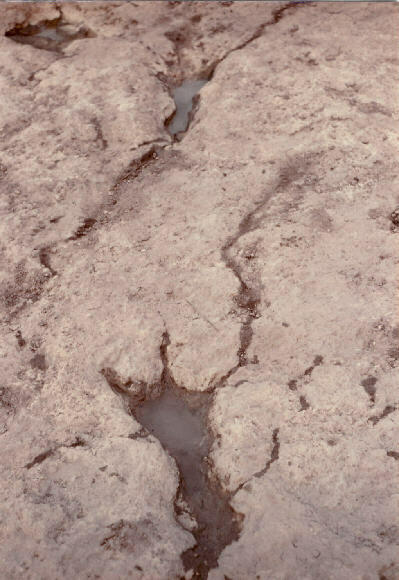 For more details on the metatarsal dinosaur track phenomena, see "Elongate Dinosaur Tracks" (Kuban, 1986a, 1986d, 1986e). The "man track" carvings and mistaken erosion marks were thus not the cause of the "man track" claims as previously suggested by some, but rather were likely secondary developments after the presumed existence of giant human tracks had become established in the minds of the locals. By the early 1980's some mainstream scientists and "creationist watchers" began to take more interest in addressing the human track claims. In 1982 a team of four scientists (Laurie Godfrey, Ron Hastings, John Cole, and Steve Schafersman), who dubbed themselves the "Raiders of the Lost Tracks," traveled to the Paluxy to conduct on-site investigations--focusing primarily on the Baugh/McFall sites and the State Park Shelf. In their subsequent reports , the Raiders noted that none of the tracks at the Baugh/McFall sites showed clear human features, and that some were shallow erosional irregularities and parts of invertebrate burrows. At the State Park shelf they observed (as others had before) that the "man tracks" were erosional features. (Schafersman, 1983). Similar analyses, plus a good refutation of the carved "man track" slabs, were published in an issue of the journal Creation/Evolution (Cole and Godfrey, 1985), whose cover proclaimed, "Paluxy River Footprint Mystery--Solved." However, the team unfortunately missed the most prevalent "man track" phenomena (the metatarsal dinosaur tracks), and misdiagnosed some of the markings at the sites they visited. This was probably due in part to the brevity of their visit (only a few days), and their not having seen all the sites and evidence. Even at the Baugh sites they were not able to do much cleaning or mapping, and except for some preliminary work by Hastings, they had not seen the Taylor Site in person (which was under shallow water). Nor were they familiar with the Alfred West Site. Thus, Godfrey initially misconstrued (based largely on photos and previous suggestions by others) that the Taylor Site tracks "man tracks" were middle digit impressions of typical tridactyl tracks, where mud had slumped over the outer digit marks (Godfrey, 1981). Another report (Milne and Schafersman, 1983) suggested that a creationist photo showed that some of the Taylor Site tracks were typical tridactyl tracks whose side digits were covered with sand (actually the light areas thought to be sand-covered were actually brushed- off parts of the substrate). 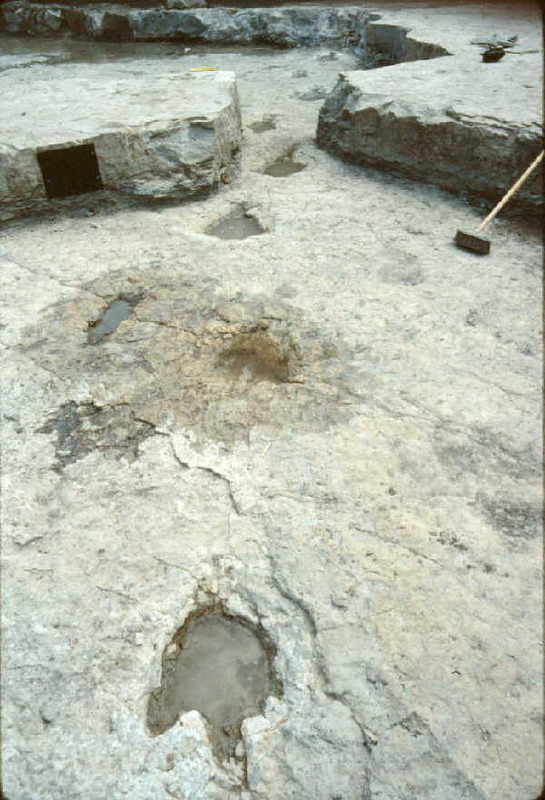 In the C/E report, the Raiders described the Taylor Site "man tracks" as simply "poor" specimens of bipedal dinosaur tracks, and mistook the partial metatarsal impressions at the Baugh sites as dinosaur hallux (digit one) marks (Cole and Godfrey, 1985). (True hallux marks, when present, are generally tiny, pointed impressions positioned toward the inside rear of the foot, not blunt elongations directly behind it). Although the Raiders field work was thus incomplete, they did provide the first substantial mainstream critique of the Paluxy claims, and also addressed some of Baugh�s other alleged �out-of- order" fossils and artifacts, discussed later. Taylor Trail, west end, 1984. Track IIS,+2 at bottom. This was perhaps the most renown alleged human trail. Note anterior splaying and indications of a tridactyl (3 toed) dinosaurian digit pattern. Ron Hastings, a member of the "Raiders" team and native Texas, developed a strong interest in continuing research in the Paluxy, especially concerning the Taylor Site, perhaps suspecting the Raiders had not fully solved the mystery there after all. Hastings and I ran into each other in 1984 while we were both examining some new excavations at the Baugh/McFall sites. Having read the Raiders� initial reports, I felt compelled to share with Hastings my own findings. He was surprised when I explained the metatarsal dinosaur track phenomena, and eager to join me in further study and documentation at the Taylor Site. Fortunately, a recent spell of dry weather had lowered the water level in the river, affording us an excellent opportunity to do more work at the site. Shortly after our collaboration began, Hastings and I independently discovered interesting color and texture features on many of the Taylor Site tracks. The colorations, ranging from bluish gray to rust- brown, more precisely defined the track boundaries than did the topographic relief (indentations) alone, and occurred on some newly discovered tracks with little or no relief, and in some cases even positive (raised) relief. On many of the tracks both the dinosaurian digit marks and the metatarsal segments were more distinctly defined by these color/texture boundaries, further confirming the metatarsal dinosaur track identification (Kuban 1986d ; Hastings 1987a). Hastings and I were originally perplexed at the source of the color distinctions (initially thinking they might related to a geo-chemical change relating to pressure from the trackmaker�s steps). However, we soon pursued a more likely hypothesis, that the colorations related to secondary sediment infillings. This concept was initially advocated by Kyle Davies, a paleontologist from the University of Texas to whom I showed the tracks in September of 1985, and soon became increasingly well supported with additional study. Evidently secondary sediment had become trapped and hardened into the original track depressions (in ancient times), and later , after modern exposure, had partially eroded or sloughed out of some of the prints (more so in the center and rear portions, being more tightly trapped in the narrow digit areas). Taylor Trail, under shallow water, 1985. The infilling areas are more brownish than in 1984, providing distinct contrast with the limestone substrate. Track IIS,+2 at bottom. Taylor Trail track IIS,+4, 1985, under shallow water. Compare with the non-infilled dinstinct metatarsal tracks on the Alfred West site. Taylor Site, central portion. Under shallow water, 1985. Here two alleged human trails, the Giant Run (GR) Trail and Taylor (IIS) trails intersect with each other and another infilled metatarsal dinosaur track sequence, IIDW. 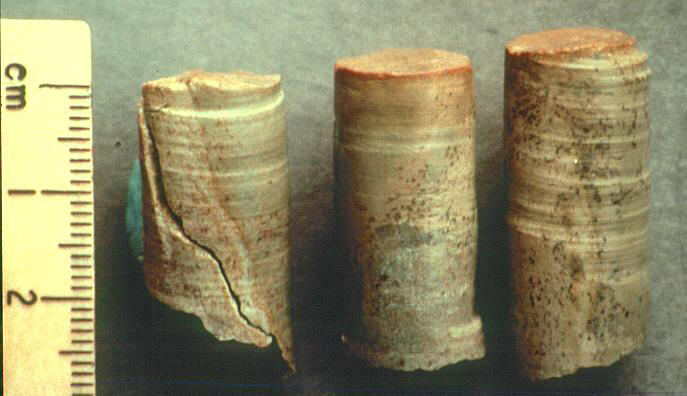 In order to test the infilling concept, in 1985 Ron Hastings and I obtained permission from the Texas Department of Parks and Wildlife to take small, cylindrical core samples across the coloration boundaries, and into the subsurface. The core samples clearly confirmed the infilling conclusion. They showed distinct subsurface boundaries between two sediment types, extending several centimeters downward and inward, as would be expected for infilled tracks. Microscopic analysis of the cores (done with the assistance of Wann Langston at the University of Texas, James Farlow of Indiana/Purdue University, and Joseph Hannibal of the Cleveland Museum of Natural History, further elucidated the composition of the core samples. The infilling material was found to be finer-grained, more dolomitic, and more iron rich sediment than the surrounding substrate. The main color of the infilling was a light bluish-gray, except for some rusted areas at the surface, evidently representing oxidation of the iron within the infilling. 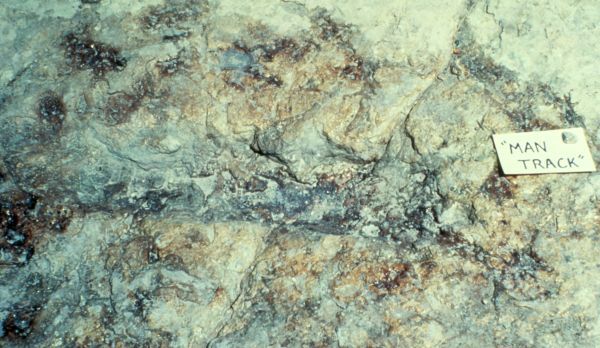 Core sections, clearly showing that the surface color and texture distinctions related to infillings of the original track depressions. Note that the infillings extend well into the subsurface in each case. Hastings and I observed that the infilling surfaces on man of the tracks were becoming increasingly rust colored as the months passed, evidently in response to repeated exposures from the recent excavations (involving alternating wet/dry episodes), promoting oxidation of iron in the iron-rich infilling material (Kuban 1986e; Hastings 1987a). The increasing rust color, in turn, increased the contrast from the lighter colored limestone, and helped explain why the coloration/infilling features were overlooked in the past (although traces of the color distinct infilling boundaries are visible in many early photos). In October of 1985 Hastings and I gave a tours of the Taylor and West Sites to Raiders team member Steve Schafersman, and to paleontologist James Farlow (mentioned above), who was conducting his own track research focusing on sauropod tracks in Texas (Farlow, 1987; Farlow et al, 1989). Both were impressed with the evidence at both sites, and agreed that the Taylor Site tracks were infilled, metatarsal dinosaur tracks. With help from Farlow and other paleontologists (many of whom had acquired a renewed interest in dinosaur footprints in recent years), I also began to compile additional examples of metatarsal dinosaur trackways from sites in other parts of the U.S., as well as other countries (Kuban, 1986d). The metatarsal dinosaur tracks invited new insights into dinosaur locomotion and behavior. Hastings and I pondered: what would cause certain bipedal dinosaurs to sometimes make metatarsal, apparently plantigrade tracks? One possibility we considered is that such tracks may have been made by dinosaurs walking in a lowered, crouched position, perhaps while foraging for food, or stalking prey. Such a lowered position would significantly decrease the angle at the talus (ankle), thus fostering metatarsal impressions. Another possibility was that some dinosaurs may have walked more flat-footed in attempts to gain firmer footing in soft or slippery sediment. Or, perhaps some dinosaurs had an unusual leg anatomy that would encourage such behavior (most of the metatarsal tracks represent somewhat smaller dinosaurs, with narrower digits, than most of the digitigrade tracks near Glen Rose). A final possibility is that the tracks represent a pathology of some sort, which seems less likely, in view of the numbers of trails involved, and the lengths of the paces (generally at least as long as that expected for typical digitigrade tracks). 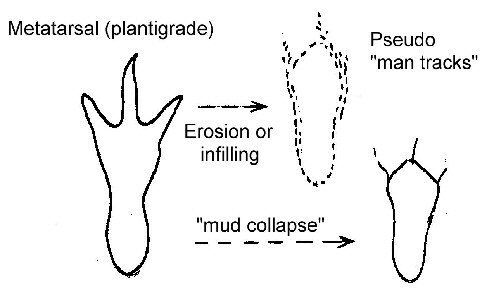 In any case, the evidence was plain that the posterior track extensions were metatarsal impressions, not merely eroded specimens of typical tridactyl dinosaur tracks, nor incidental products of a dinosaur foot sinking in deep mud, since the metatarsi were often fully and flatly impressed, especially at the Alfred West site (Kuban 1986d, p. 58-62). Drawimgs B and C represent possible trackmaker postures associated with metatarsal tracks and plantigrade locomotion by bipedal dinosaurs. The infilling/coloration phenomenon not only made the metatarsal dinosaur track identification regarding the Taylor Site more obvious, but also was scientifically interesting in its own right. It illustrated that tracks can act like sediment traps (even in ancient times), and underscored the importance of cleaning a tracksite well in order to not miss tracks that may be defined more distinctly by infilling boundaries than topographic relief. In fact, the color-distinct infillings allowed Hastings and I to discover many previously unknown tracks and trackways in the Paluxy, including several new trails at the Taylor Site, including the only trail in the Paluxy that can be confidently attributed to an ornithopod (bipedal, plant-eating) dinosaur. We also wondered if metatarsal tracks, and/or color distinct infilled tracks, would be found at sites outside the Paluxy, which turned out to be the case (Kuban 1986a, p. 68- 69; 1986b, p. 439-440; Martin, 1986). During this Taylor Site work in 1984 and 1985, Hastings and I also continued our mapping and study of the Baugh/McFall sites, while Baugh and his followers continued to excavate new sections, finding more "man tracks" with each exposure. By this time a growing number of creationists were becoming disenchanted with Baugh�s methods and claims, especially after he seriously botched an excavation of an important Acrocanthosaurus dinosaur skeleton one of his associates discovered a few miles upriver (Potter, 1984b). Alfred West had grown so disturbed with Baugh�s increasing improprieties and unfounded claims that he went to a local newspaper to try to set the record straight. In the resulting article, West related that he had personally observed that Baugh�s methods were very unscientific, and his claims flatly contradicted by the physical evidence (Potter, 1984a). Shortly thereafter the same newspaper printed an editorial by myself supporting West�s comments and briefly summarizing my own research (Kuban, 1984). Subsequently, further critiques were also published by the Raiders and others on Baugh�s alleged "out of order" artifacts and fossils, including an alleged "human tooth," "trilobite," a hammer, and a "human finger" (Baugh, 1987). The tooth, found in the Paluxy in 1987, was demonstrated to be a Cretaceous fish tooth (Hastings, 1987b, 1995). The trilobite, reportedly found decades ago in the Paluxy, was not documented in situ, and is of dubious origin at best. Both the trilobite and its surrounding matrix are unlike other fossils found in the Paluxy, but are like many prepared specimens of the common midwestern genus Calymene, routinely sold at gem and fossil shows Glen Rose (Hastings, 1986, p. 24). The hammer, reportedly from a paleozoic formation near London, Texas, is encased in a concretion and thus may be unrelated to the age of the host rock (Godfrey and Cole, 1985, p. 46); Kuban (1979). The "human finger" was reportedly found in a loose gravel pile and thus cannot be linked to a specific formation. Moreover, most workers consider it just an interesting shaped stone, not a real fossilized finger. Other artifacts from Texas and elsewhere claimed by Baugh to be "out-of-order" fossils are similarly lacking in scientific support (Strahler, 1990). In 1985 I was deeply saddened to learn that my friend and ally, Ernest Booth, had recently passed away. I became even more resolved to formally publish my findings on the Paluxy matter to and help set the record straight, as Booth always wanted. Although criticisms of Baugh�s work seemed to have little positive effect on him, I wanted to give other human track advocates a final opportunity to reevaluate their Paluxy claims before formally publishing my findings. I had for years invited the leaders of ICR on several past occasions to revisit the sites and restudy the evidence, but now decided to send many recent photographs, site diagrams, and other documentation in order to illustrate the full extent of evidence against the past claims. In response, John Morris of ICR, Paul Taylor (now running the film company founded by his deceased father, Stan), and other company representatives, accepted my invitation to join me at the sites in October of 1985. While I pointed out to them the various metatarsal dinosaur tracks at the Alfred West site, and their similar but largely infilled counterparts at the Taylor Site, Morris and Taylor expressed concern that they had made serious errors in the past. Taylor stated that he would stop circulating Footprints in Stone, and Morris indicated that he would probably stop selling his book. Although they insisted on uncovering some Taylor Site tracks under water and mud along the north bank (which we were able to view using an aquarium pushed through the water), they afterward agreed that all the tracks viewed at the site showed evidence of dinosaurian origin. We also reviewed the "man tracks" at the Baugh sites, which Morris and Taylor did not defend, and discussed the State Park Shelf markings (considered erosional features by most), which they did not feel worth revisiting. I then asked Taylor and Morris if they could point to any markings, anywhere in the Paluxy, which they still believed to be human or even probable human footprints. They could not. Within days after the on-site meetings, Paul Taylor did stop distributing the film, and many months later John Morris did stop selling his book. However, their published statements on the matter fell short of full or frank retractions of past claims, and misrepresented recent work and evidence. Both suggested the human track claims were now merely "in question," and that they had done the bulk of careful field work in recent years. 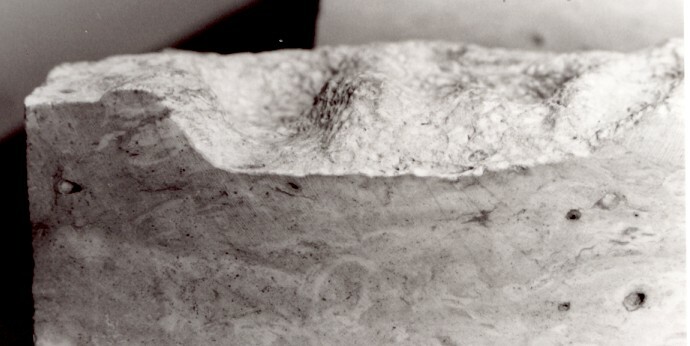 They also suggested that some of the markings may still be human, and suggested that the dinosaurian interpretation of the Taylor Site tracks relied entirely on suspicious "surface stains," (Taylor, 1985), with Morris even insinuating that they might have been fraudulently applied (Morris, 1985; Morris, 1986). Thus they obscured the abundant evidence that the colorations related to secondary infillings, and the fact that the dinosaurian interpretation was not dependent on the colorations, but was also well supported by other evidence such as tridactyl digit impressions (where the infilling was incomplete or partly sloughed out on many of the tracks). Nor did they clarify that such dinosaurian digit indentations on the Taylor Site tracks were noticed as early as 1970 by the Loma Linda team--long before the infilling features were even recognized (Kuban, 1986b). Despite these serious problems in Morris� and Taylor�s statements, they did prompt other creationist groups to cease or temper their "man track" promotions. Several creationist organizations acknowledged that the "man tracks" were now in serious doubt, or that creationists should no longer use them as evidence against evolution (Burrows, 1986). However, some repeated and endorsed Morris�s unfounded suggestions of artificial staining, (Lang, 1986; Snelling, 1986), and a few individuals (such as Baugh) continued to defend at least some of the "man track" claims (Valentine, 1986), suggesting that Morris and Taylor were hasty in admittng even possible mistakes. Later in 1986 one of the more reputable creationist groups, Students for Origins Research, invited me to publish my findings in their quarterly periodical Origins Research, including maps and photos of the Taylor Site evidence (Kuban, 1986a). Shortly thereafter the anti-creationist journal Creation/ Evolution requested from me and published a similar summary (Kuban, 1986c). In order to avoid any misunderstanding about my motives, I included an "afterward" in the latter article stating that my purpose was "not to attack creationism but to help set the record straight on the true nature of the Paluxy evidence." I hoped OR and C/E articles would help clarify the Paluxy evidence to those interested in the controversy from either camp. However, I still looked forward to having my findings published in a more formal scientific format. Coincidentally, about the same time James O. Farlow informed me about an upcoming scientific conference, entitled "The First International Symposium on Dinosaur Tracks and Traces." The conference was to be held in Albuquerque, New Mexico later that year, and would feature track researchers from all over the world. Taking Farlow�s advice, I subsequently wrote and was privileged to present two papers at the conference: one on elongate, metatarsal dinosaur tracks and another the color distinct tracks (Kuban 1986d, Kuban 1986e). The papers focused on the scientific aspects of these phenomena, about which the attending scientists seemed very interested, judging from the lively question/answer sessions after the talks. However, during the presentations I also mentioned their connection to the "man track" claims, and a number of attendees expressed relief that the claims (which many had heard about) had finally been given a more complete explanation. Several dinosaur "trackers" approached me afterward to say that they too had seen similar elongate dinosaur tracks on various sites. Coworker Ronnie J. Hastings balancing above a trail of large, infilled, color-distinct ornithopod tracks with positive relief, on a steep hillside west of Denver, CO, recognized shortly after the 1986 International Conference on Dinosaur Tracks and Traces in Albuquerque, NM. Several news reporters at the conference ran with the "man track" angle, leading to positive (though not always accurate) coverage in Time, Discover, and several other major magazines and newspapers (Lemonick, 1986; Martin; 1986; Wilford, 1986). Moreover, an interesting case of serendipity occurred during a field trip after the conference, when a previously unknown trackway of color distinct, infilled ornithopod tracks were discovered near on a hillside near Denver. A reporter from The Denver Post who had joined the trip wrote that Jim Farlow, upon spotting the tracks, yelled, "Hey...Paul Olsen! ...you've got to see this! It�s the same thing that Glen Kuban was talking about at Glen Rose. The colorations and everything!" (Martin, 1986, p. 5C). Later the proceedings of the conference were published in a book entitled Dinosaur Tracks and Traces (Gillette and Lockley, 1989). In more recent years most creationists have largely abandoned the Paluxy "man track" claims, although a few individuals continue to promote them. Carl Baugh, whose once promoted the Taylor Site tracks as human but later claimed he never did so (after the 1985 backpedaling by other creationists), reversed himself yet again by claiming along with Don Patton that the Taylor Site tracks were both human and dinosaurian. That is, they claimed the dinosaur tracks contained human tracks within them (Baugh, 1987)--a claim as unsupported by the physical evidence as the original track claims (Kuban, 1989a). Baugh and Patton also continue to claim that the "Burdick Track" and other loose slabs from Glen Rose are authentic (Baugh, 2005), despite the fact that they show serious anatomic problems, and are considered probable carvings even by most creationist workers. In recent years Baugh and associates have also promoted a number of "new" alleged human tracks and supposed "out of place" artifacts from outside Glen Rose, including the "Zapata track", "A.M. Coffee Track", "Lake Erie sea monster", and a "Limestone Cowboy." However, none of these have stood up to close scrutiny, nor to my knowleged are any of these supported by major creationist organizations. A smattering of other authors also continue to heavily promote Paluxy "man tracks" or the related claims mentioned above, including Ronald Powell of Christian International Ministeries (Powell, 2006), who follows Clifford Burdick's example of distorting Roland Bird's early writings to suggest that Bird saw and accepted genuine human footprints in the Paluxy. Some human track claims also have been made for sites in Arizona (Rosnau et al., 1990), but these appear equally unconvincing (Kuban, 1992), as do some rehashings of old Paluxy claims (MacKinney, 1989). In 1994 a "Paluxy Task Force" formed by BSA but later disbanded by the same group, independently published a small book (Helfinstine and Roth, 1994) defending claims of Baugh and associates; however, their photographs failed to demonstrate any convincing human tracks or other "out of order" fossils. 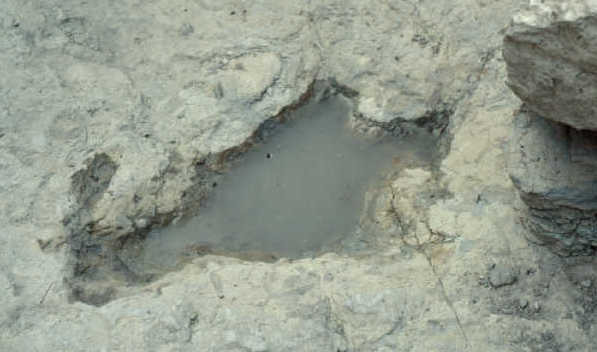 Rather than scientifically dispute the metatarsal dinosaur track explanation for many of the "man track" claims, the authors simply omitted any mention of the concept. Aside from these and a few other exceptions, most creationist leaders seem willing to let the track controversy fade. The Bible-Science Association (which ceased publication of the BSA newsletter and renamed itself "Creation Moments" in 1997), and has made only a few unsupportive comments on the claims in recent years. ICR, although still selling The Genesis Flood with "man track" claims intact, appears content to leave the issue "in question" and "mysterious." Even the Creation Research Society, whose journal published articles on "humanlike" tracks in Arizona in 1990, has since made little mention of the subject. In 1987, Art Chadwick of Loma Linda University, wrote an update in Origins reaffirming the conclusions of the 1970 Loma Linda team, and summarizing the more recent work that further confirmed the dinosaurian nature of the most renown "human" tracks (Chadwick, 1987). Likewise, to its credit, the increasingly prominent creatioist organization Answers in Genesis (AIG) included the Paluxy tracks among its list of "Arguments we think creationists should NOT use." The Biblical Creation Society (BCS), a creationist group headquartered in Great Britian, installed a web article in 2002 which gave a mostly accurate summary of the controversy, largely supported my research and conclusions, and took Baugh, Patton, John Morris, and Kent Hovind to task for their faulty Paluxy "man track" promotions, and even criticized Baugh's dubious credential claims--something most creationist groups have ignored. Nevertheless, AIG, ICR, CRS, BCS, and other strict creationist organizations continue to promote a young earth and the belief that humans and dinosaurs were contemporaries. In fact, right after cautioning creationists about the Paluxy evidence, the AIG web site asserts "However there is much evidence that dinosaurs and humans co-existed." If one follows the associated web link, however, one finds only a list of articles on largely speculative matters such as living sauropod dinosaurs in Africa, and supposed "Human and Dinosaur Tracks" in Turkmenistan, Russia (Golovin, 1996). Ironically, the latter article presents no compelling case for "human" tracks. All that was actually reported (and not well documented) was a single "humanlike" marking, which as the Paluxy tracks demonstrate, is hardly convincing evidence human origin. Golovin acknowledges that "one needs to be cautious about accepting the prints described on the basis of just this report. None of our sources has been able to obtain any further information on the prints, nor any photograph to this date." One wonders then why the markings were called "Human" in the title, or why AIG claims there is "much evidence" of human/dinosaur coexistence. In fact, this assertion appears inconsisent with other statements on the AIG website. For example, another AIG article acknowledges, "As far as we are aware at the present time, there are no indisputable human fossils in the fossil record that we could say belong to the pre-Flood human culture(s)." (Snelling, 1991). Another AIG article states, "We can only concur that there is no definite unequivocal evidence of human remains in those rock strata that can definitely be identified as Flood sediments." (Batten et al, 2005). Claims of human tracks occurring alongside dinosaur tracks have not stood up to close scientific scrutiny, and in recent years have been largely abandoned even by most creationists. Although genuine dinosaur tracks are abundant in Texas, the alleged Paluxy "man tracks" involve a variety of misidentified phenomena. 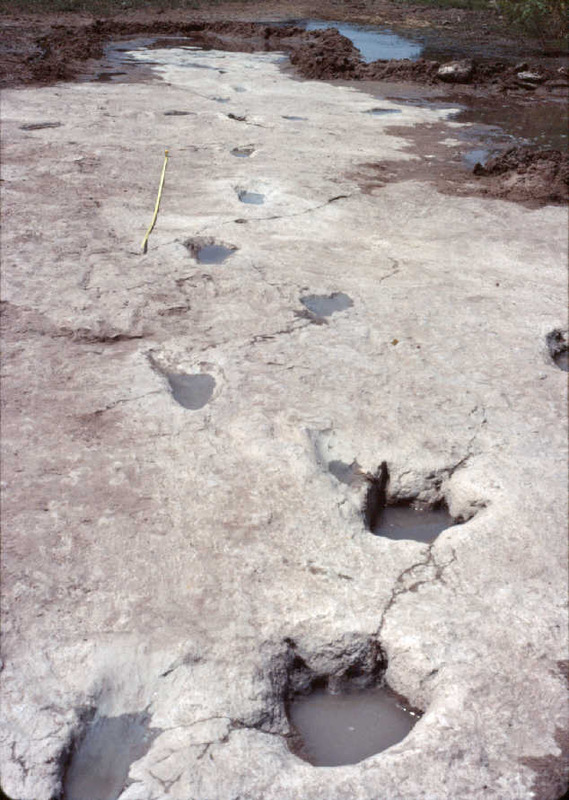 The most celebrated "man tracks" on the Taylor Site are forms of "metatarsal" dinosaur tracks--made by dinosaurs which, at least at times, made elongate prints by impressing their metatarsi (soles and heels) as they walked, rather than walking on their toes only. When the digit marks on such elongate/metatarsal tracks are subdued by sediment infilling, mud- collapse, erosion, or a combination of factors, the metatarsal segment at the rear often presents an oblong shape that roughly resembles a large human footprint. Other alleged "man tracks" include erosional features and indistinct markings of uncertain origin, some of which were enhanced with water or oil at times to appear more human. A smaller number of "man tracks" are outright carvings or heavily doctored depressions (most of these occur on loose blocks of rock). Claims of other "out of order" fossils and artifacts from Texas and elsewhere are also not supported by compelling scientific evidence. Andrus, Pearl.Et. Al. 1975, Somervell Sketches, Self Published. p. 26. Although Andres attributes the first track discovery to Ernest (Bull) Adams, most other sources, including newspaper articles during the year of the discovery, credit Bull's brother George Adams with this discovery. Some authors such as James Farlow (1993) indicate that the year of the discovery was 1908, but local newspaper accounts at the time confirm that it occurred in the spring of 1909 (probably March 2009, since the Weekly Enterprise (Cleburn, TX) of April 8, 1909 indicated that George Adams found the tracks "some weeks since..."). Batten, Don, Ken Ham, Jonathan Sarfati, and Carl Wieland, 2006, Where are all the Human Fossils? Web version at: http://www.answersingenesis.org/docs2/4419.asp Another version of the article appears on the ChristianAnswers.net website at: www.christiananswers.net/q-aig/aig-c014.html, indicated to be an excerpt from Creation Magazine, Dec 91-Feb 92, Vol. 14, No. 1, pp. 28-33. Baugh, Carl E., 1982, Enemies Survived Together for A While (Video Tape). Creation Evidences Museum, Glen Rose, TX. Baugh, Carl, E. 1987, Dinosaur. Promise Publishing, Orange, CA. 151 pp. Baugh, Carl. E. 2005, "The Burdick Track," in "museum displays" section of the Creation Evidence Museum website, http://www.creationevidence.org. Bergan, Gail R, and Jeffrey G. Pittman, eds., 1990, Nearshore Clastic Carbonate Facies and Dinosaur Trackways in the Glen Rose Formation (Lower Cretaceous) of Central Texas. GSA Field Trip #8, The Dallas Geological Society, Dallas, Texas. Beierle, Fredrick P. 1974. Giant Man Tracks. Prosser, WA. Perfect Printing. 35 pp. Bird, Roland T., 1939, Thunder in His Footsteps. Natural History. Vol. 43, p. 254-261. Bird, Roland T., 1941, A Dinosaur Walks into a Museum. Natural History. Vol. 47, p. 74-81. Bird, Roland T., 1944, Did Brontosaurus Ever Walk on Land? Natural History. Vol. 53, p. 60-67. Bird, Roland T., 1954, We Captured a Live Brontosaur. National Geographic. V. 105, p. 707-722. Bird, Roland T., 1985, Bones For Barnum Brown: Adventures of a Dinosaur Hunter. Schreiber, V. T. ed. Texas Christian University Press, Fort Worth, 225 pp. Booth, Ernest, 1982, Correspondence with author (Glen Kuban) regarding Paluxy controversy. Copies provided upon request. Burrows, William D. 1986, The End of the Paluxy Footprint Story? North American Creation Movement Newsletter. Victoria, B.C., Canada, March, No. 36. p. 3-5. Burdick, Clifford C., 1950, When Giants Roamed the Earth. Signs of the Times, July 25, p. 6, 9. Chadwick, Arthur V. 1987, Origins, Vol. 14, No. 1, p. 33-40. Cole, John R., and Laurie R. Godfrey, eds., 1985, Creation/Evolution, Issue 15, Vol. 5, No. 1. Dougherty, Cecil N., 1971, Valley of the Giants. Bennett Printing Co., Cleburne, TX. Dougherty, Cecil N., 1979 (6th edition), Valley of the Giants. Bennett Printing Co., Cleburne, TX., 76 pp. 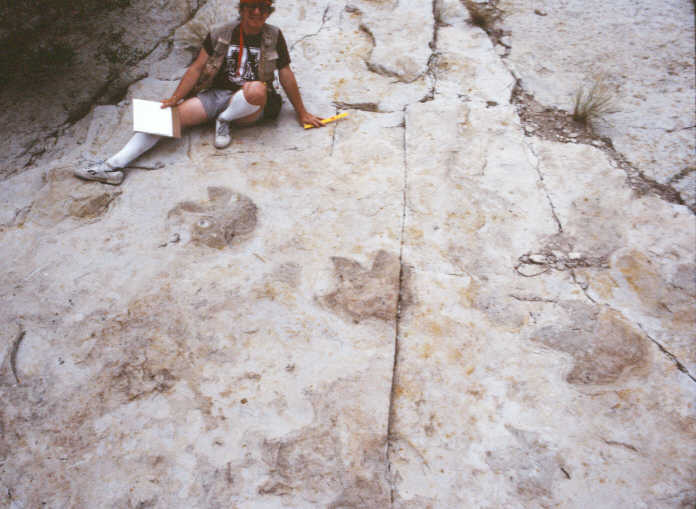 Farlow, James O., 1987, Lower Cretaceous Dinosaur Tracks, Paluxy River Valley, Texas. SCGSA, Waco. Farlow, James O. , Pittman, Jeffrey G., and Michael Hawthorne. 1989, Brontopodus birdi Lower Cretaceous Sauropod Footprints from the U.S. Gulf Coast Plain, In Gillette and Lockley (1989), Dinosaur Tracks and Traces. Cambridge University Press, New York, p. 371-394. Gillette, D. D., and M. G. Lockley, 1989, Dinosaur Tracks and Traces. Cambridge University Press, New York, 454 p.
Godfrey, 1981, An Analysis of the Creationist Film Footprints in Stone. Creation/Evolution, Vol. 6, pp. 23-30. Golovin, Sergei, 1996, Creation, Vol. 18 No. 4, p. 52 (September 1996). Hastings, Ronnie J., 1985, Tracking Those Incredible Creationists. Creation/Evolution, Issue XXI, Vol. 5, No. 1, pp. 30-42. Hastings, Ronnie J., 1986, Tracking Those Incredible Creationists: The Trail Continues. Creation/Evolution, Issue XVII, Vol. 6, No. 1, pp. 19-27. Hastings, Ronnie J., 1987a, New Observations on Paluxy Tracks Confirm Their Dinosaurian Origin. Journal of Geological Education, Vol. 35, No. 1, pp. 4-15. Hastings, Ronnie J., 1987b, Creationists' "Glen Rose Man" Proves to be a Fish Tooth (as Expected). NCSE Reports, Vol. 9, No. 3, pp. 14-15. Hastings, Ronnie J., 1988, Rise and Fall of the Paluxy Man Tracks. Perspectives on Science and Christian Faith (Journal of the ASA), Vol. 40, No. 3, pp. 144-155. Hastings, Ronnie J., 1995, A Tale of Two Teeth, or, the Best of, the Worst of Teeth. Creation/Evolution, Issue 36. Vol. 15, No. 1, pp. 1-14. Helfinstine, Robert F., and Jerry D. Roth, 1994, Texas Tracks and Artifacts. : Do Texas Fossils Indicate Coexistence of Men and Dinosaurs? Privately published by authors. 109 pp. Jasinski, Laurie E., 2008, Dinosaur Highway: A History of Dinosaur Valley State Park, Texas Christian University Press. Kuban, Glen J. 1984, Researcher Doubts Tracks On Paluxy Were Made by Man. Cleburne Times-Review, Oct. 21, p. 3A. Kuban, Glen J., 1986a, The Taylor Site Man Tracks. Origins Research, Vol. 9, No. 1, pp. 1-9. Kuban, Glen J., 1986b, Review of ICR Impact Article 151, Origins Research, Vol. 9, No. 1. Kuban, Glen J., 1986c, A Summary of The Taylor Site Evidence. Creation/Evolution, V. 6, No. 1, p. 10-18. Kuban, Glen J., 1986e, Color Distinctions and Other Curious Features of Dinosaur Tracks Near Glen Rose, Texas. In: Gillette, David D. and Martin G. Lockley, eds., Dinosaur Tracks and Traces, 1989, Cambridge Univ. Press, Cambridge, p. 427-440. Kuban, Glen J., 1989a, Retracking Those Incredible Man Tracks. NCSE Reports, Vol. 9, No. 4 (Special section.). Kuban, Glen J., 1989b, A Matter of Degree: An Examination of Carl Baugh�s Credentials. NCSE Reports, Vol. 9, No. 6, p. 15- 20. Kuban, Glen J., 1992, Do Human Footprints Occur in the Kayenta of Arizona? Origins Research. V. 14, No. 2, p. 7, 12, 16. Lang, Walter, 1986, Untitled article in mailing from The Genesis Institute, Richfield, MN., p. 1. Langston, Wann, Jr., 1974, Nonmammalian Comanchean Tetrapods. Geoscience and Man, Vol. 8, pp. 77-102. Lull, Richard S., 1953, Triassic Life of the Connecticut Valley (revised edition). Bulletin of the Connecticut State Geological and Natural History Survey, Vol. 81, pp. 193-196. Lemonick, Michael B., 1986, Defeat for Strict Creationists. Time, Vol. 127, No. 26, p. 75. Milne, David H., and S. Schafersman, 1983, Dinosaur Tracks, Erosion marks, and Midnight Chisel Work (But No Human Footprints). Journal of Geologic Education, Vol. 31 , p. 111-123. Martin, Claire, 1986, On the Trail of Dinosaurs. The Denver Post, June 5, p. 1C-5C. Morris, John D., 1976, The Paluxy River Tracks. Acts & Facts/Impacts, No. 35, p. i-viii. Morris, John. D., 1979, History and Importance of the Paluxy River Project and Finds (Science, Scripture, & Salvation ICR Radio Broadcast Nos. 381-384. Morris, John D., 1980, Tracking Those Incredible Dinosaurs. San Diego, CA, Creation-Life Publishers, 240 pp. Perkins, B. F., and Langston, Wann Jr. 1979, Dinosaur Tracks and Plants: Amer. Assoc. of Stratigraphic. Palynologists. 12th ann. meeting Field Trip Guide, Rev. 1983, 61 pp. Perkins, B. F. and Steward, C. L. 1971, Dinosaur Valley State Park. In Trace Fossils, A Field Guide to Selected Localities, Louisiana State Univ. School of Geoscience. Pub #17-1, pp. 56-59. Potter, Karren, 1984a Dinosaur Excavation Assailed. Fort Worth Star-Telegram, October 25, p. 17A. Potter, Karren, 1984b. Rancher Disputes �Man Tracks� Proof. Fort Worth Star-Telegram, Sept. 27. Rose, Peter J. (2007). "A new titanosauriform sauropod (Dinosauria: Saurischia) from the Early Cretaceous of central Texas and its phylogenetic relationships" (web pages). Palaeontologia Electronica 10 (2). http://palaeo-electronica.org/2007_2/00063/. Rosnau, Paul O., J. Auldaney, G. F. Howe, and W. Waisgerber, 1990, Are Human and Mammal Tracks Found Together with the Tracks of Dinosaurs in the Kayenta of Arizona? (Parts I and II). Creation Research Society Quarterly, Vol. 26, Nos. 2 and 3, p. 41-48, 77-98..
Rusch, Wilbert H., Sr. 1971, Human Footprints in Rocks. Creation Research Society Quarterly, pp. 201-213. Segraves, Kelly L., 1975, The Great Dinosaur Mistake. San Diego, CA. Beta Books, 96 pp. Schafersman, 1983, Raiders of the Lost Tracks: The Best Little Footprints in Texas. Skeptical Inquirer, Vol. 248, No. 6. Shuler, Ellis W., 1917, Dinosaur tracks in the Glen Rose limestone near Glen Rose, Texas: American Journal of Science, Vol. 44, p. 294-298. Shuler, Ellis W., 1935, Dinosaur Track Mounted in the Band Stand at Glen Rose, Texas," Field & Laboratory, Vol. IV, No. 1 (Nov. 1935). The bandstand was officially dedicated on April 6, 1933. Snelling, Andrew, 1986, Paluxy Controversy Continues. Creation Ex-Nihilo, Vol. 8, No. 2, p. 37. Strahler, Arthur N., 1987, Science and Earth History - The Evolution/Creation Controversy. Prometheus Books, New York. p. 462-470. Taylor, Jana 1982, Newest Paluxy Tracks Make International Press. Missouri Association for Creation. Newsletter, Spring, Vol. 1, No. 2, P. 10. Taylor, Stanley E., 1968, Search for Man Tracks in the Paluxy River. Films for Christ Special Report. October. 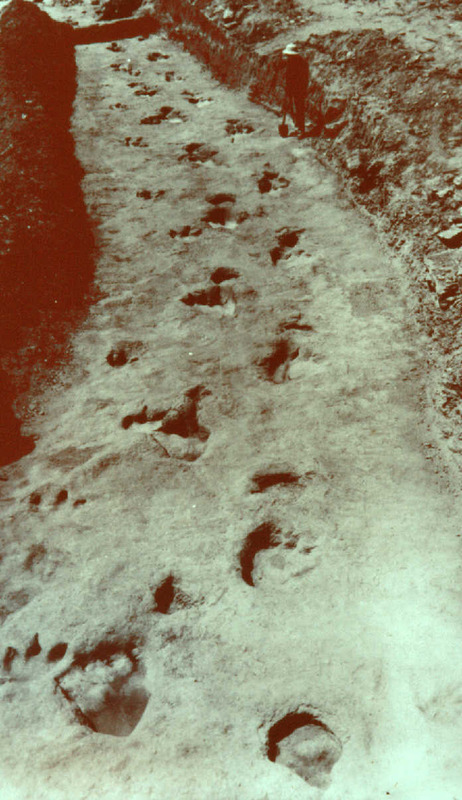 Taylor, Stanley E., 1971, The Mystery Tracks in Dinosaur Valley. Bible Science Newsletter, Vol. 9, No. 4, pp. 1-7. Taylor, Stanley E., 1972, Footprints in Stone (film), Films for Christ Association (Eden Films), Elmwood, IL (now Mesa, AZ). Taylor, Paul S., 1985, Notice Regarding the Motion Picture Footprints in Stone. Mesa Arizona, Films for Christ Association, December, Form N-6. Taylor, Paul S., 1986, Footprints in Stone: the Current Situation. Origins Research. V. 9. No. 1, p. 15. Valentine, Tom, 1986, Untitled Article. The Spotlight, Feb. 3, p. 14. Wilder-Smith, A. E. 1975, Man�s Origin, Man�s Destiny. Bethany Fellowship. p. 293-298. Wilford, John Nobel, 1986, The New York Times, June 17, p. C3. Fossils of �Man Tracks� Shown to be Dinosaurian. Whitcomb, John C., and Henry M. Morris, 1961, The Genesis Flood. Baker Book House, Grand Rapids, MI, pp. 173-175. Young, Keith P., 1974, Lower Albian and Aptian (Cretaceous) ammonites of Texas, In: Perkins, B. F., ed. Aspects of Trinity Geology: Geoscience and Man, School of Geoscience, Louisiana State University, Vol. 8, p. 175-228. Zuidema, Henry P., 1979, Creationist Scientists Discount 'Giant Men' Stories. Liberty Magazine, May/June.